When it comes to applying educational loan to bank, it is important to submit required documents like, address proof, college bonafide certificate, estimation of fees for upcoming years and fees receipt if you have already paid fee. So you should approach your college Principal and should write a formal letter requesting for issuing fee receipt. We have decided to write this letter because one of our friend had this situation. The situation- My friend applied for educational loan during his first of engineering course. In the first year, the exam fee should be paid at the time of admission and so there was no chance to pay the fee after getting the loan. In fact, the loan can be applied after getting the admission in any course. He was in the first semester and he paid all the fees including hostel fee and mess fee. The bank will usually offer loan by cheque in the name of the Principal of the college and the college will encash the cheque for the particular student. As he paid the first fee, it is not necessary to pay by cheque for his first year course and the future year, the fee may be paid through cheque issued as bank load for him in the name of the college. So bank asked him to submit the fee receipts along with his bank loan application in order to get the loan amount for the first year to his account. He needed to write a letter to collect all the fee receipt he already paid to the college. Here is the sample letter format he had written to the college Principal. I, R.Henry, studying I year B.E Civil Engineering. I am going to apply for educational loan for my entire study (4 years). In this connection, I need to submit the fee receipt of college tuition fee, mess bill and hostel fee. So I hereby request you to give me the receipts for tuition fee, hostel fee and mess bill for the year 2017-18. Thanking you! Thanks for reading Sample letter to Principal requesting to issue fees receipt. 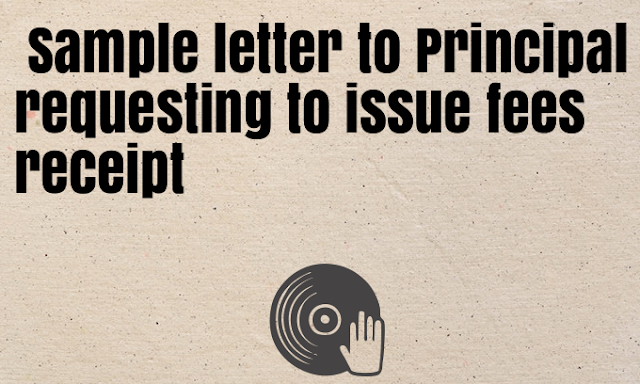 You need to make necessary changes in the letter format to make it suitable for your situation and needs.